BeenThere-DoneThat: The South Downs (1), Sussex. 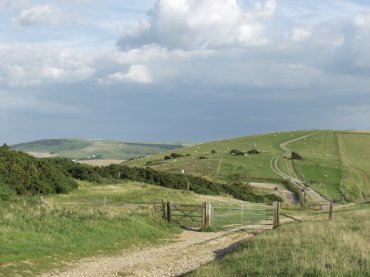 The South Downs consists of rolling chalkland between Winchester, Hampshire in the west and Eastbourne, Sussex in the east. There are deep dry valleys, steep scarp slopes with panoramic views across the wooded farmland of the Weald and distant glimpses of shimmering sea. Hundreds of years of sheep grazing has produced a distinct short springy turf rich in wild flowers. 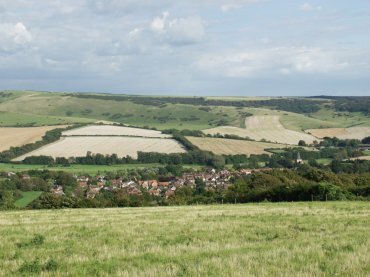 The village of Alfriston nestling in the Cuckmere valley seen from the South Downs. The church tower and spire is visible on the right. The village was known originally as Aelfrictun, from 'tun' (farmstead) of Aelfric' (Saxon name), and was recorded in the Domesday Book as Alvriceston. 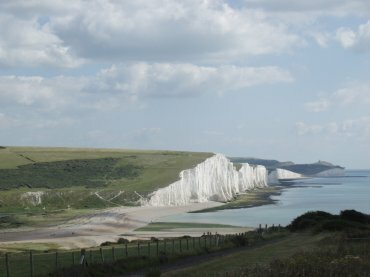 The Seven Sisters chalk cliffs, which form part of the seaward end of the Downs, from Seaford Head looking towards Birling Gap. These cliffs, which stretch between Birling Gap and Cuckmere Haven, reach a maximum height of about 500 feet. The beach in the foreground is Cuckmere Haven. At the end of the Cuckmere Valley where the Cuckmere River discharges into the sea is a gap in the cliffs known as Cuckmere Haven which now forms part of the Seven Sisters Country Park. 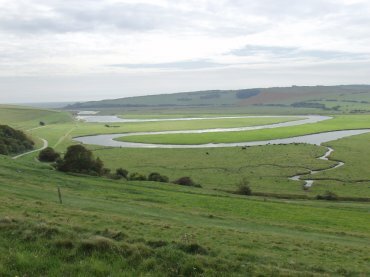 You can see, here, the classical meanders of the Cuckmere River as it makes it's way lazily towards the sea which is just visible on the horizon to the left of the picture. On the extreme left of the picture is part of the path which will take you from the Seven Sisters Country Park Visitor Centre to the beach at Cuckmere Haven right next to the white chalk cliffs of the Seven Sisters. 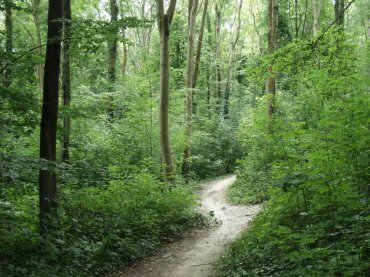 This forest, covering about 2000 acres of undulating ground and consisting mainly of Beech, lies about 1.5 miles north of the Seven Sisters cliffs and is accessible to pedestrians and cyclists. The South Downs Way long distance footpath passes through this forest.